May God bless you and keep you. Only seven simple words. And yet, Christians believe that when spoken with faith and spiritual authority these words are more than the sum of their parts. They genuinely convey a spiritual reality. And though it may be unseen, it is no less real. This is why prayers of blessing are so valuable. And it’s the reason we should make praying them a priority. Consider the following example as you meditate on how you can incorporate blessing prayers into your prayer life. And that you may trust him for provision and protection. And that you may serve God and neighbor, placing their needs above your own. And that you may long for the heavenly home that Christ is preparing. 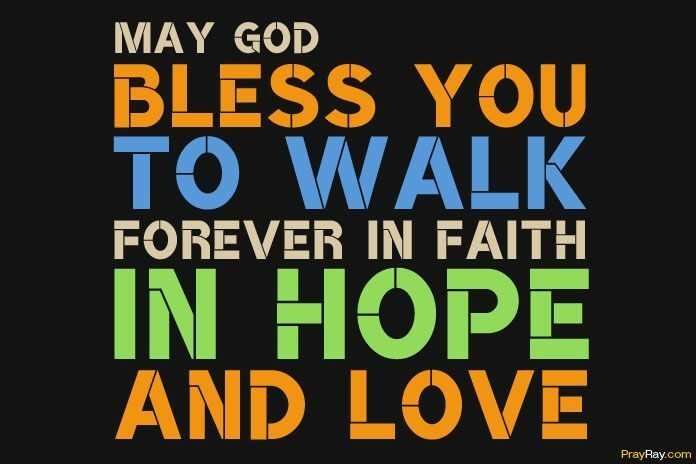 May God bless you to walk forever in faith, hope, and love. Prayers of blessing like the one above are valuable because, as we’ve already noted, they convey spiritual realities. Contrary to the old saying, “Sticks and stones may break my bones but words will never hurt me,” words have a profound impact on human beings – for good or evil. This is why scripture has so much to say about both blessing and cursing. When a minister prays a prayer of blessing over a congregation, the sound doesn’t just echo off the walls. Those words enter into the minds of congregants and has tangible results. They remind us of who God is, what God has done, and what he has yet to do. But they’re more than that. When the words God bless you and keep you are accompanied by faith, something supernatural happens. God communicates himself and his grace through these words of blessing. Consider the blessing prayer in light of a more mundane experience. When you’re in love with someone and you hear those three little words, “I love you”, what happens? Butterflies fill your belly. Angels begin singing. You’re overwhelmed with a feeling of transcendence. Shouldn’t the same experience accompany the words, God bless you and keep you? It is, after all, a similar statement. Only the subject is not another human but God, our Creator and Sustainer. This is the power of the blessing prayer. It reminds us of the simple truth that God loves us and is with us, providing us all we need. If you have little experience with prayers of blessing, they may seem foreign or odd at first. But all it takes to familiarize yourself with them is to spend a little time with the blessings found in scripture. Read Numbers 6:24-26, Ephesians 3:16-20, and Colossians 1:9-12 for a few examples. You’ll hear common words and themes in the many blessings of scripture. The Father, Son, and Spirit are often all called upon to work in their particular ways. Blessing, protection, and provision are often requested. And the fruit of the Spirit along with the will of God are common themes. Keep these ideas in mind as you pray and blessing prayers will become a natural part of your prayer life.